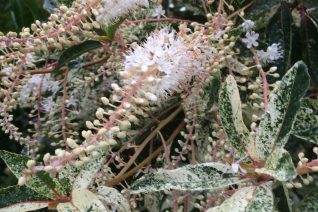 Variegated form of Japanese summer sweet with amazing white splashed foliage and masses of powerfully fragrant white flowers all summer. To 10′ tall moderately fast in part shade to full sun in rich, moisture retentive soil. Regular summer water. In time it forms a trunk that displays mottled exfoliating bark which is very pretty. . Wonderful woodland tree that endures full sun with regular irrigation. Light yellow fall color. Graceful at all times. Nice branching pattern in symmetrical whorls. The clusters of flowers dry and cling to the tree in winter. These can be removed by the fastidious gardener or left to hang and decompose with the effect of spanish moss. Blooms continuously most of the summer. The clusters of pendant white flowers emit an intoxicating perfume that is most notable on warm to hot days. It will perfume the entire garden- its not a cloying sweetness either but a much more sophisticated aroma that has you seeking more. Water regularly, not drought adapted. Lovely, lovely specimen tree. Avoid hot dry sites.